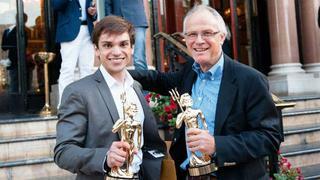 Each year an important part of the ShowBoats Design Awards is the Young Designer of Year Award, which recognises burgeoning talent in the yachting industry. The competition is open to design students and those just starting their careers, and it aims to launch the careers of young design talent. 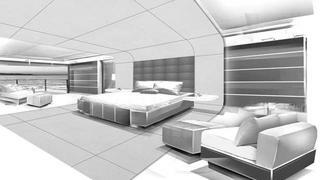 Chairman of the Young Designer of Year competition, Roger Lean-Vercoe sets out a task for the young designers, and this year was one of the toughest yet – design the exterior lines, interior layout and interior design of a new 65m motor yacht for a well-known collector of classic and modern sports cars. The client dislikes formality and was open to new and interesting ideas, and he plans to use his yacht for world cruising and exploration, but he definitely did not want an ‘explorer’ yacht. Myriad technical requirements were tasked beyond this to the would-be young designers, and the judges were pleased that 40 students and newly graduated designers submitted their work this year, reportedly with universally high standards with the top scorers submitting more balanced entries. 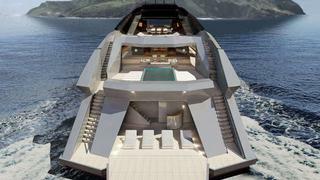 Superyacht builder Oceanco sponsors the Young Designer of the Year Award, so even making it as a finalist in the competition is hugely beneficial to a young designer. The top five finalists receive complimentary access to the two-day Superyacht Design Symposium to be held in Kitzbühel, Austria on 24-25 February and an all-expenses paid trip to visit Oceanco shipyard in Allblasserdam, The Netherlands. Yet there can only be one winner who takes home the €5,000 prize money, a golden Neptune trophy and the honour of being named Young Designer of the Year. 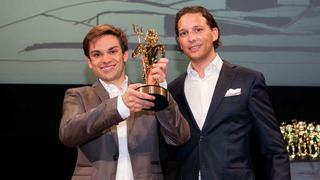 And this year, that honour went to Stefano Inglese for his concept Project Granturismo. The judges considered that Inglese’s design best fit the task parameters – particularly in the exterior design, which met the hypothetical owner’s love of ‘masculine and stylishly edgy’ design, while the interior layout also fulfilled the client’s many demands. Of his design, Inglese says, ‘Granturismo is inspired by the charm and the silhouette of classic “granturismo” sport cars, designed to deliver the same feelings when travelling en plein air; sliding fast over the sea, finding freedom in the wind and sunset. Granturismo is a boat made to communicate to the human soul, placing human emotions and joy of life in first place.’ Inglese studied architecture at Roma Tre University and benefitted from the University’s open design philosophy, which allowed him to try many design disciplines. Granturismo is inspired by the charm and the silhouette of classic “granturismo” sport cars, designed to deliver the same feelings when travelling en plein air; sliding fast over the sea, finding freedom in the wind and sunset. We interviewed the 2013 Young Designer of the Year and found out what winning the award has meant to him, how it will shape his future in yacht design and what it was like to meet his superyacht design icons. 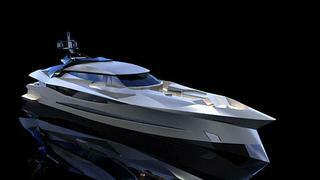 Boat International: How did you get involved in Young Designer of the Year? Stefano Inglese: Last year, I saw Benjamin Toth receive the award and understood the great opportunity to be awarded so young. I worked hard and sacrificed weekends and evenings. The more the design grew, the more I was excited and began to be sure about my success. BI: What was your inspiration for Granturismo? Inglese: The indicated client was a well-known collector of classic and modern sport cars, so I decided to give him something inspired from car styling, by the best Granturismo from Modena. A boat that looking at her, he wouldn’t miss his beauties parked home during his long trips around the world. Honestly, I didn’t want something with the shape of a car, I just tried to steal the “sculptural tension” and the “compressed power” of the best racing cars. It’s a concept quite old, that belongs to the Futurist movement in art that influenced Italy and, in a small way, England in the 1930s. BI: How did it feel to be named as 2013 Young Designer of the Year? Inglese: When my name was called, the feeling was just pure joy. All the best people in the industry congratulated with me after that, and I felt like in a sort of “reality show” because the situation seemed so strange and spectacular – it was going faster than my imagination. BI: Did you get to meet any designers you admired? Inglese: Everyone was iconic there. But John Munford [who received the Lifetime Achievement Award] was the best meeting; not only is he an [icon] in yacht design, but he did [show] me that a great professional can be at the same time also very nice, kind and, most important, with a subtle sense of humour. This was a very important lesson I learned. BI: How was the networking? Inglese: I made a lot of connections, all part of the reward. You become instantly someone at least “recognisable” by the industry’s most influential people. I found myself in a table with the owners, founders and directors of important yards with a huge building tradition and outstanding quality, also in design. I hope to develop these fantastic connections the best I can and demonstrate all of my value professionally and, more importantly, personally. BI: What does winning the Young Designer of the Year Award mean to you? 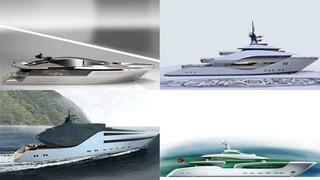 Inglese: I would like to thank Oceanco and Boat International Media for recognising young designers. Both confidence and recognition for designers entering the industry are fundamental, and this award supports that. Receiving the award has inspired me to work and study even harder. BI: What are you working on now? 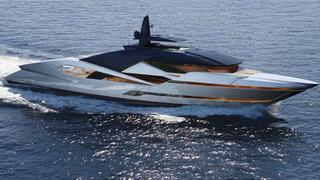 Inglese: Currently I’m refining an open sport yacht, which I designed with great volumes inside. BI: What are your career ambitions? Inglese: Frank Ghery said one time that all the designers have the perfect project in their mind and they follow it in every step of their career. I hope one day to build the boat that fits the best to the perfect one I have in my mind. Look for a full feature on the 2013 Young Designer of the Year finalists and winner in the September 2013 issue of Boat International Magazine.